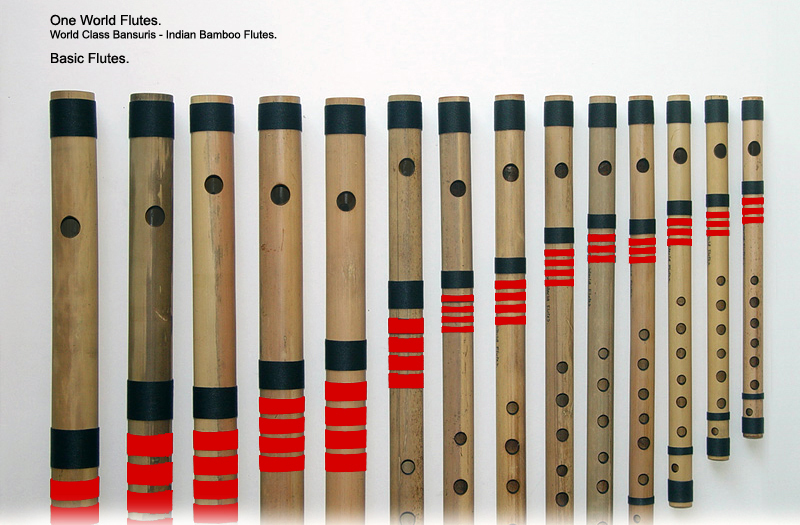 Basic Bansuris - Indian Bamboo Flutes. 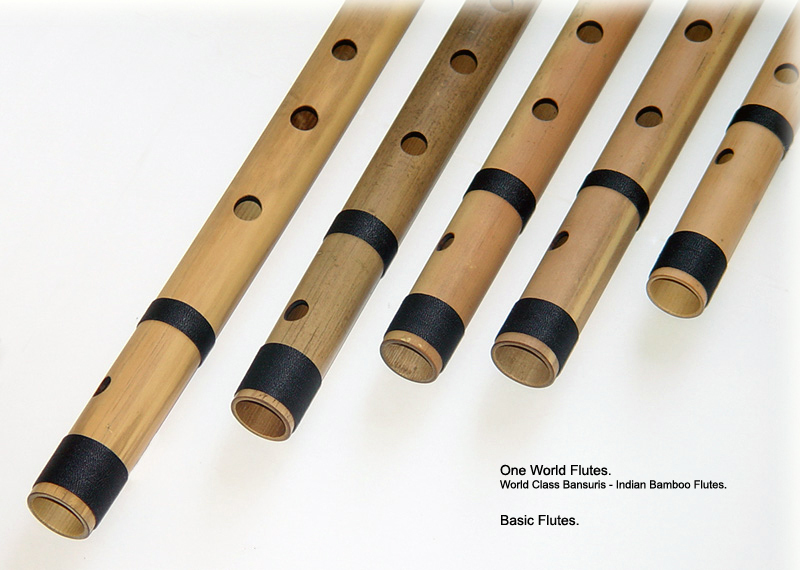 These Bansuris, Designed by Kirti L. Shah, Rival Professional - Concert Quality Flutes. Do NOT let the name, Basic Bansuris fool you. Other WebSites are selling this Quality of Flutes as Professional - Concert Flutes. 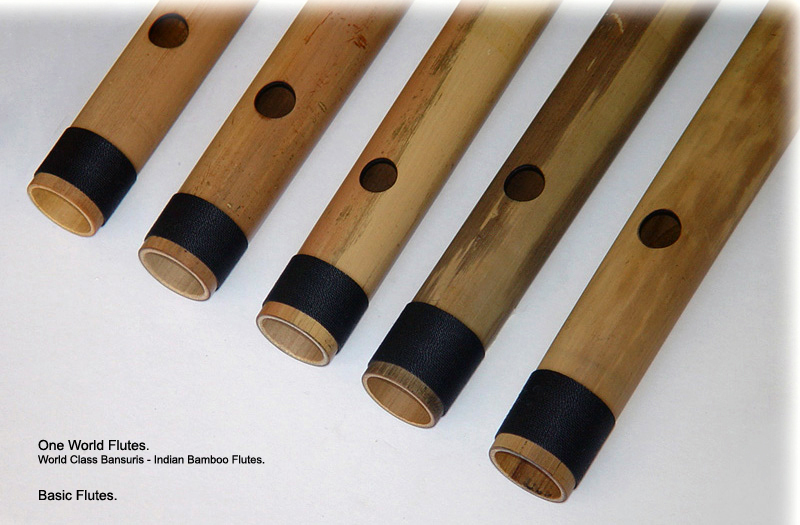 These are better than most WebSites like Amazon, Flip Cart, and other E Retailers selling Bansuris Flutes as Professional - Concert Flutes. Basic Flutes, are created in India. Previously known as Fine Bansuris. 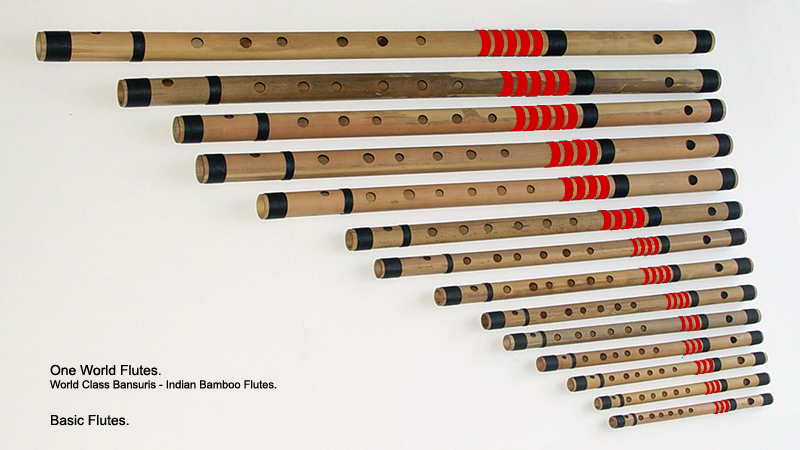 Basic Flutes ..... A = 440 Hz. Natural Note, is listed with no 'n'. Example, Basic Flute. C. G.
Sharp Note, is listed as '#'. 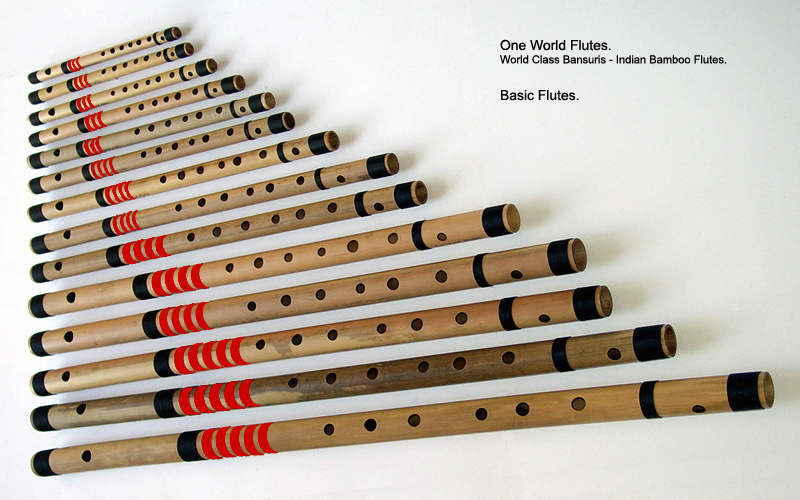 Example, Basic Flute. C #. G #. For Easy to Follow Flutes Call - Out. In PDF Format. 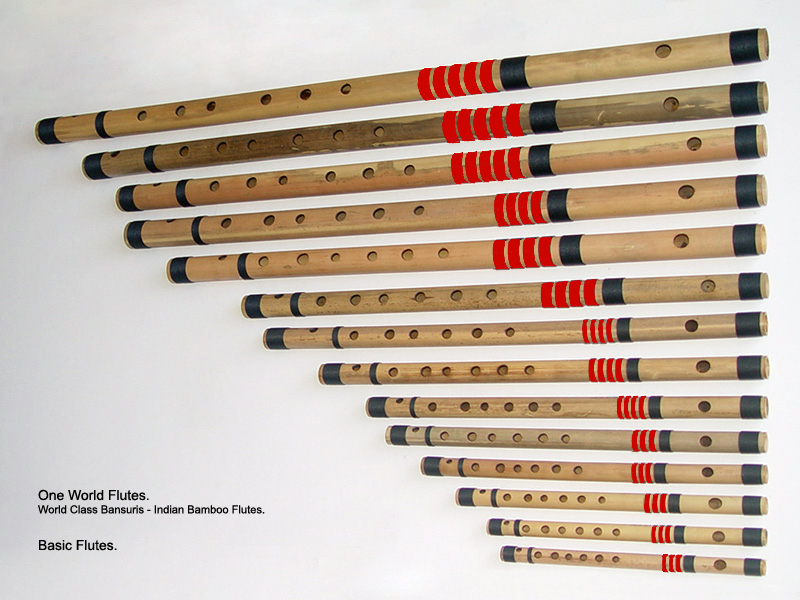 Stock Flutes are 7 Finger Hole Design. Note : These are Basic Quality Flutes. Basic Flutes. A = 440 Hz. L. D. Price. Notes. Tonic : C. Key : G. 8" 0.5" $20.00 C Natural. Small. Basic Flute. B. F #. Tonic : B. Key : F #. 9" 0.5" $20.00 B Natural. Small. Basic Flute. A #. F.
Tonic : A #. Key : F. 10" 0.5" $20.00 A Sharp. Small. Tonic : A. Key : E. 11" 0.5" $20.00 A Natural. Small. Basic Flute. G #. D #. Tonic : G #. Key : D #. 12" 0.5" $20.00 G Sharp. Small. Tonic : C. Key : G. 13" 0.5" $20.00 G Natural. Medium. Basic Flute. F #. C #. Tonic : F #. Key : C #. 13" 0.5" $22.00 F Sharp. Medium. Tonic : F. Key : C. 14" 0.6" $24.00 F Natural. Medium. Tonic : E. Key : B. 15" 0.6" $26.00 E Natural. Medium. Basic Flute. D #. A #. Tonic : D #. Key : A #. 17" 0.6" $28.00 D Sharp. Medium. Tonic : D. Key : A. 17" 0.6" $30.00 D Natural. Medium. Basic Flute. C #. G #. Tonic : C #. Key : G #. 18" 0.7" $38.00 C Sharp. Medium. Tonic : C. Key : G. 19" 0.7" $46.00 C Natural. Medium. Basic Flute. B. F #. Bass. Tonic : B. Key : F #. 21" 0.7" $50.00 B Natural. Bass. Basic Flute. A #. F. Bass. Tonic : A #. Key : F. 22" 0.8" $56.00 A Sharp. Bass. Basic Flute. A. E. Bass. Tonic : A. Key : E. 23" 0.8" $64.00 A Natural. Bass. Basic Flute. G #. D #. Bass. Tonic : G #. Key : D #. 25" 0.8" $72.00 G Sharp. Bass. Basic Flute. G. D. Bass. Tonic : G. Key : D. 26" 0.9" $82.00 G Natural. Bass. Basic Flute. F #. C #. Bass. Tonic : F #. Key : C #. 27" 0.9" $88.00 F Sharp. Bass. Basic Flute. F. C. Bass. Tonic: F. Key: C. 28" 0.9" $96.00 F Natural. Bass. Basic Flute. E. B. Bass. Tonic : E. Key : B. 29" 0.9" $110.00 E Natural. Bass. Or E. Bass. Basic Flute. D #. A #. Bass. Tonic : D #. Key : A #. 32" 1.0" $120.00 D Sharp. Bass. Basic Flute. D. A. Bass. Tonic : D. Key : A. 34" 1.0" $130.00 D Natural. Bass. Basic Flute. C #. G #. Bass. Tonic : C #. Key : G #. 35" 1.1" $150.00 C Sharp. Bass. Basic Flute. C. G. Bass. Tonic : C . Key : G . 36" 1.1" $160.00 C Natural. Bass. Basic - Flutes Sets : A = 440 Hz. Basic Flutes Set. 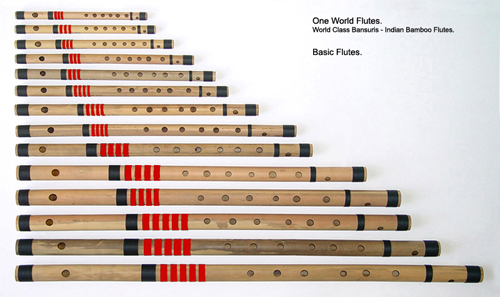 5 or More Flutes make up a Basic Flutes Set. Get a Additional 10 % Discount. You can Pick and Choose any 5 or More Flutes from the List above.